Beloved son, brother and friend Tristen Hunter Short passed away on February 8, 2019. Tristen was born on August 6, 1996 in Casper, Wyoming, the first son of Brian and LaVerla Short. Tristen was an adventurous soul who loved to enjoy the beautiful Wyoming outdoors with his family and friends. Though he was a hard-working young man, his favorite way to spend his time was surrounded by friends and family, laughing and having fun. He lit up a room with his infectious smile and the mischievous twinkle in his eyes. He is lovingly remembered for his playful banter, fierce loyalty and dedication, and zest for all that life had to offer. He will be deeply missed. Tristen is survived by his parents, Brian and LaVerla Short, his four younger siblings Ethen, Kaylie, Alexie, and Ashten, his grandparents Donna and Don Buckalew of Parker, CO and Hunter Short of Casper, WY, and Marsha Bitzenhofer of Casper, WY, and Tom Lorenzen of Sheridan, WY. 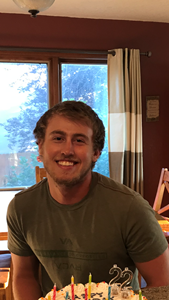 Celebration of Life services for Tristen will be held Friday, February 15, 2019 at 10:00 am at HOPE Church, 520 S Walnut St, Casper, WY 82601. Please have flowers sent to Newcomers Funeral Home. Add your memories to the guest book of Tristen Short. Sending our heartfelt condolences to your family. Daily may God give the strength needed (Ps.34:18) to cope with such a tragic loss. Tristen touched the lives of others and will always be fondly remembered. Our hearts and prayers go out to you and your family. This is not the way life is supposed to be. I can remember the times when we would get together at a restaurant, Grandma Elaine’s or your house; when the kids were younger. I recall all the fun we had; chasing, swinging, laughing and getting acquainted with the kid’s endless variety of pets. And the times we spent together at the lake fishing. As I remember, there were several times we even caught a few. It all seems so recent and yet so long ago. And even though we haven’t spent much time together over the recent years we still have fond memories of those years when the kids were young and so full of life. We trust that the memories you have of Tristen (and all of the kids) growing up will help you through this time of grieving and into the years to come. May God touch your lives in a special way and give you peace & healing through all of this. Don’t hesitate to let us know if there is anything we can do to help you through this time. Tristen was always SO caring and put his friends and family first. He knew how to light up a room, whether it was with his smile or with his jokes. He was very social and spontaneous. Tristen you will be missed. You already are! My main one-on-one interaction with Tristen was when he was helping James get the basement remodeled at HOPE. I remember us talking about how his hands were being used to release the inheritance he received from his parents and how his work mattered for the Kingdom. I remember him expressing wonder about this and the look on his face told me he was receiving it as true. He showed an emotional sensitivity that expressed a core belief that people matter! I will continue to live my life showing the person in front of me, more now than ever before-in honor of Tristen, that they matter. The Connells love the Shorts! Words cannot express the sorrow we feel at the loss of such a very tender and special person. I will miss our talks so much you always knew how to make me laugh! I will miss that infectious smile and the way u could light up a room with your personality! I always loved how you saw the best in everybody and how u never had anything bad to say about anyone!! I remember the first time I met him, i was the newbie and was very shy!! But he made sure to go out of his way and make me feel welcome!! I'll never forget that adventurous spirit and how he made the most out of everything he did!! I will cherish the memorable moments we shared and the goid times we had!! Your family and friends that became my best friends will be in my prayers! Tristen and my son became friends after attending WCCA in Guernsey. Tristen had a kind heart and cared deeply for his friends. Hunter was in a very serious car accident; Tristen messaged me daily until he was “out of the woods”. Tristen came home from Casper with Hunter one day, fit right in with Hunter’s siblings and family, riding dirt bikes and playing video games. He did light up a room, his smile was easy and kind. My heart aches for your loss and our prayers are with you. The day I met you, I spent 8 hours in a pickup with you on our way to good ole Nodak. We clicked, almost instantly. Your giggle was contagious. Always nothing but laughter and joy. From work, to outside of work, you were a pleasure to be around. May your memory and soul live on in all of us! Tristen was a one of a kind friend. No matter who he met they instantly fell for his amazing personality and his love for others along with his funny jokes. Ill miss all the nights driving around town listening to throwback songs and singing our hearts out. He had a heart full of love, a smile full of laughter, and a soul filled with nothing but pure kindness. 5 years of friendship wasn’t enough. The day I met Tristen I knew he was going to be a friend for life! He was one of the first friends I made when I moved to Casper. He was always positive, supportive, and would do anything to help. We shared many laughs and long nights in the oilfield. My favorite memories include: camping/boating at Alcova Lake every summer, our many limo rides, working together in -40 degree North Dakota weather, and many joyous times surrounded by our friends. Our thoughts, love, and prayers are with all of you. Though we hadn’t seen Tristen for many years we remember him as a sweet young man.